Throughout the five seasons of AMC’s Breaking Bad, Walter White, or as he’s known to the underworld, Heisenberg, and Jesse Pinkman have relied on chemistry for more than making meth. With the show’s final arc scheduled to begin later today, I started to wonder about all the science behind one of the best shows on television. With the help of her student Melodie Lettkeman, Breaking Bad science advisor and University of Oklahoma chemistry professor Donna Nelson weighed in on the fact and fiction behind some of the greatest chemistry moments so far on the show. University of New Mexico chemistry department chair Steven Cabaniss and University of Oregon chemistry department head Michael Haley provided additional comments. Is highly pure meth made “the old fashioned way” really blue? Near the end of season 1, Walt and Jesse realize there’s no way they can collect enough pseudoephedrine from over-the-counter medications to make several pounds of meth a week. They decide to go old school and cook with methylamine instead. The resulting crystal meth comes out in a striking blue color. Nelson said that’s not realistic. In season one, episode seven, Walt claims the near perfect chemical makeup of his meth is responsible for the trademark hue of the product. In real life, switching from pseudoephedrine to methylamine would have no effect on the visible look of the drug, except a possible perceived discoloration similar to the greenish hue very thick glass sometimes has. Sometimes very pure crystals appear to have a bluish color, because in our minds, we compare them to other typical crystal samples which are slightly impure and therefore have a very slight yellow tinge. The color change would likely have little effect on the market- in the show, the color is simply associated with the very powerful substance Heisenberg produces. According to the DEA, colored meth is very likely flavored. Why does hydrofluoric acid eat through a ceramic bathtub, but not a plastic container? One of the most gruesome scenes in the entire series hits viewers in season 1, episode 2. Jesse ignores Walt’s instructions to melt drug dealer Emilio’s dead body down with hydrofluoric acid in a plastic container and instead opts for his house’s ceramic bathtub. The acid eats through the tub and floor, resulting in a gross, splattered mess. Ceramic materials are made up of many atom of the element silicon. Fluorine loves to make strong bonds with silicon and thus HF will “eat” through ceramic, glass, etc. ; any material made of silicon atoms. But Nelson is skeptical of Walt’s choice of hydrofluoric acid. Despite its impressive resume as a tough solution, it wouldn’t have been the best option to dissolve a body. Typically, flesh is dissolved with a base, most commonly sodium hydroxide (lye), generally used in the disposal of road kill. This option would have been a lot safer to use to dissolve Emilio, too. Lye is a common clog remover in drains, so Jesse’s bathtub stunt would not have been so disastrous. It also would have been safer because the fumes are not nearly so toxic. Most household uses of hydrofluoric acid are diluted to 3 percent hydrofluoric acid in H2O, in order to make them safe for use. Sure, Jesse was wearing his mask when he began the reaction, but the fumes would have infiltrated the house, and would have damaged most exposed surfaces inside, by the time the acid had eaten through the tub. How powerful is a mercury fulminate explosion? 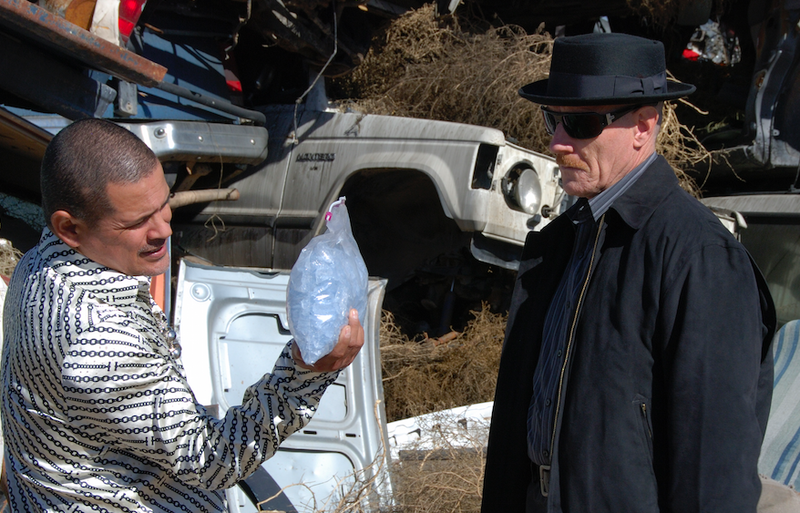 Walt gets explosive in season 1, episode 6 when he visits drug lord Tuco’s lair. Aware that Tuco and his cronies had just put Jesse in the hospital for demanding money upfront in return for their meth, Walt brings along a secret weapon: mercury fulminate. He passes it off as meth and then slams it on the ground when Tuco threatens him, resulting in an explosion that breaks windows and sets off car alarms, but doesn’t seem to cause any lasting damage for the people in the room. Mercury fulminate makes very loud and “sharp” explosions on contact, and has been used in (dangerous) “practical jokes.” Very small amounts can be painted onto a chair or toilet seat; the victim sits down and a loud pop ensues. I would not carry it around, since any sudden jarring could set it off. I’m surprised Walt’s “demo” explosion did not set off the larger bag he held up afterwards. Call it dramatic license, i.e., exaggeration, on the part of the show. An explosion the size of what they show would likely leave people deaf and/or severely injured. You would be stupid to put in in a baggie in your pocket, especially the amount you might need to cause the damage you see on the show. According to the Chemical Rubber Company’s Handbook of Chemistry and Physics, it can come in large crystal form. In fact, crystallizing the compound makes it more pure, and thus more reactive. In real life, Walt’s entire bag of tweaked chemistry would likely have detonated a lot sooner than planned and much more violently — few, if any people, would have survived inside the room. Can you actually make thermite from an etch-a-sketch? Would it burn through a lock like that? In season 1, episode 7, Walt and Jesse need a way to break into a chemical warehouse to steal a barrel of methylamine. Walt takes inspiration from an etch-a-sketch in Jesse’s garage that they crack open to harvest aluminum powder. They use it to produce thermite, which dramatically burns through the warehouse’s lock. Aluminum powder is definitely an ingredient in thermite. Walt and Jesse could have easily purchased the powder in larger supply had they just gone to a hardware store, since our calculations suggest they’d need close to 200 etch-a-sketches to fill the baggie in the show. The thermite reaction does indeed melt metal; it can be used for welding. It is a favorite demonstration for some high school chemistry teachers (including mine) — sparks, smoke, flame, etc. but in a controlled, non-explosive fashion. I don’t know why more people don’t carry aluminum powder for opening locks. [Walt and Jesse] would need to give the door much more space, they would have been unable to stare at the burn with unprotected eyes, and no part of the door would have been cool enough to touch in a reasonable amount of time. So, all true, a little bit over the top, but true, move along people. Despite the exaggerations i still love the show that’s the whole point its just escape, don’t need to apply bullet proof logic. Great discussion though if one wanted to know how feasible this stuff was, hope we don’t have a Heisenberg. in the making here lol. guess this guy missed the mythbusters episode where they discounted the fulminate and acid bits huh? The crystalline structure might change some of its properties, and mercury fulminate, if you take a hammer to it will explode upon impact. I have no reason to believe that it wouldn’t explode upon contact with the floor. It looks like on the show it was wrapped with tape and a plastic bad, significantly reducing the friction directly applied to the chemical substance. They also used a great excess and if they used slightly more than 50 g instead of five times the amount, maybe people could have survived. And putting it in a crystalline form would increase its purity as stated above. But as Kari pointed out, the fumes would most likely be the deadly culprit. Certainly, Walt or anyone else wouldn’t have been able to walk away without more severe injuries. I think barring the mercury inhalation, it still might be plausible if Walt’s “tweak of chemistry” included the addition of some silver fulminate as ‘suggested’ by Vince. The problem with that is that it often self-induces the reaction with merely its own weight, but if Walt had been able to suspend it in the crystal… It’s definitely plausible. Although he would never want to walk around with a bag of it as the experts above pointed out. The HF is a weaker acid, but has unique abilities. I can’t remember if they tried it on ceramic, HF is used for ceramic etching. But the fumes are dangerous. Not that I would ever dissolve a body, but I’d actually avoid acids entirely and use a strong base (sodium hydroxide). Either way, they just increased the outcomes for dramatic effect. But the chemistry is at least theoretically plausible if not practically unreasonable. I don’t mind that it’s not entirely accurate, because the show is so terrific. It’s not like that have things that I completely detest like gas tanks getting blown up because someone shoots it. Ridiculous unless the shooter has incendiary rounds. Or when people survive after falling from a height that would kill any living thing (I give Gandalf a pass because he’s a wizard). But anyways, I digress. “Aluminum power is definitely an ingredient in thermite” Aluminium powder I would guess. If the story were set in the UK, sure. Sp you watched the Mythbusters Breaking Bad special, waited a couple of weeks and then wrote it up as your own work? Bravo! This is good article except for name flaw, but way better than gizmodo’s immature posts and their self centered bloggers/writers. I’ve wondered whether the scene with the electromagnetic was really all that realistic. No expert here. But when I worked at a university Chemistry dept we had to be VERY careful around several NMR machines with magnetic flux densities 5 Tesla or higher. ANY ferrous materials would become dangerous projectiles if they came into the room and close enough to the super cooled magnet cores. A medical MRI might be 1.5 Tesla for a portable or maybe 2-3 Tesla for fixed install MRI. The exponential field strength of a magnetic field changes much more rapidly than an electric field. The closer to the magnet the field strength dramatically increases. A 1 Tesla magnet can lift a Mini Cooper vehicle while a 5 Tesla can lift an 8 ton truck. But remember many other geometric aspects (shape, size, orientation etc) of the magnetic field must be considered here. You’d still have to be very close to a magnet to get maximum effect, but electronics would much more susceptible to magnetic damage. I doubt it would a laptop particularly a hard drive (or any electronic devices for that matter) any good to be near such a strong magnetic field. WW is known as Heisenberg, NOT Heisman. Have you watched the show at all? in the summary, Donna Nelson is at the University of Oakland. In the second paragraph she’s at University of Oklahoma! I’m done reading this. Both those errors are now fixed. Heisman? He’s known as Heisman? Have you ever watched the show?